Last year towards the end of Term 3 and early Summer vacation, the Library saw an increased number of stolen laptop reports, and it seemed thieves were targeting the Library. Many of you were shocked that something like this could happen at Warwick, let alone in our beloved Library – a space which for many can feel like a home away from home, especially when you can spend most of your day (or night) within its walls (check out our blog on keeping a good work-life balance). It seemed that thieves had become wise to the fact that students lower their guard in the Library environment (it’s a secure space right? ), leaving valuables unattended and easy to take. For the victims, of course, these crimes had a huge impact. You can only imagine, if it has never happened to you, the devastating effect of losing your laptop – all that coursework, your dissertation, theses and hours spent studying – taken away in an instant. So we (your Library team) set about investigating the scale of the problem and seeing what could be done to help. We started with some number crunching: Over a two year period, there were 31 recorded laptop thefts. 16 of them happened during the 3 month period when we believe the Library was targeted, meaning that for the weeks outside of the targeted period, approximately 1 laptop was stolen every 6 weeks. Considering that the Library has literally thousands of people through its turnstiles each day (statistics show up to five thousand unique users coming and going multiple times in any one day), the spread of the issue seemed comparatively small – however (and it is a big HOWEVER), this did not in any way condone the actions of the few thieves out there, or scale down the immeasurable impact of each theft on the victims. We took advice from Campus Security, and suggestions from our Library staff, and decided our strategy to reduce thefts would involve raising awareness of the issue, along with closer monitoring of the situation from staff where possible. We had always distributed notices and flyers warning students not to leave belongings unattended, but increased the number in circulation immediately. We then focused our efforts towards students seen to be leaving their valuables unattended. We kept track as best we could of where unsupervised items were left, checking back at hourly intervals (wherever possible) until the owner returned, at which point we reminded them of the risk they had taken and advised what to do in future. Security also helped by assisting in patrols and being more visible within the building. By Term 1 in 2018/19, we had created a digital recording tool for Library Stewards, to support their monitoring activities. At the same time, on the advice of Campus Security, we added regular tannoy announcements, warning students not to leave personal items, including laptops, unattended. Things seemed to be looking up and during Term 1 we had no further reports of thefts – until the Christmas vacation in late December when there was another occurrence. In January, the Library invested in further CCTV coverage, concentrating on floors 3, 4 and 5. Further action included the development of the Library’s #KeepItSafe campaign. The goal was to remind students about the dangers of leaving valuables unattended, and to suggest a proactive solution to keeping them safe. We took into account student feedback, and also operational considerations, and then met student representatives from Warwick Behavioural Insights Team at the end of January to share our campaign plan – they really liked it. We had considered lots of ideas for the campaign, so it was good to hear from students that it made sense and fitted in with their ideas of what approach to take. The campaign had to be silent: The tannoy was distracting to people who were trying to study, and we wanted to avoid causing panic amongst students who were busy working with already a lot to think about. By making the campaign silent, it mimicked the nature of the thefts – only we wanted to give something (a Library freebie of course) rather than taking away! Risks: We needed to convey how quickly and easily thieves can swoop, without the message sounding too sinister? At one point, ‘calling cards’ (if you’ve seen the campaign mascot you can guess what they may have looked like) or stickers, to sneakily place on unattended valuables were considered. However, this was discounted as it could make it even easier for thieves to identify unattended items, or who wasn’t looking after their things. Changing perceptions (but not too much): We love that students feel safe and comfortable in the building and wouldn’t want that to change. But the Library is still a public space and it’s not the same as studying at home – would you leave a phone or laptop on a table in a café whilst popping to the bathroom? Probably not. We needed to get the message right – not scaring everyone away, but ensuring the risks were understood. We also needed to encourage people to take responsibility for their own belongings – after all, the heartbreak of losing a laptop definitely doesn’t outweigh the convenience of a quick toilet or coffee break. The solution: We wanted to make “keeping valuables on you at all times” as easy as possible. Packing up everything on your desk every time you want to grab a book is cumbersome. With high demand on study space, leaving a desk empty could result in it being nabbed! We though a handy fold away bag would be useful – something to quickly throw your valuables into (laptop, phone, purse/wallet) when visiting the café, bathroom or shelves, avoiding a juggling act and having to carry the entire desk with you. 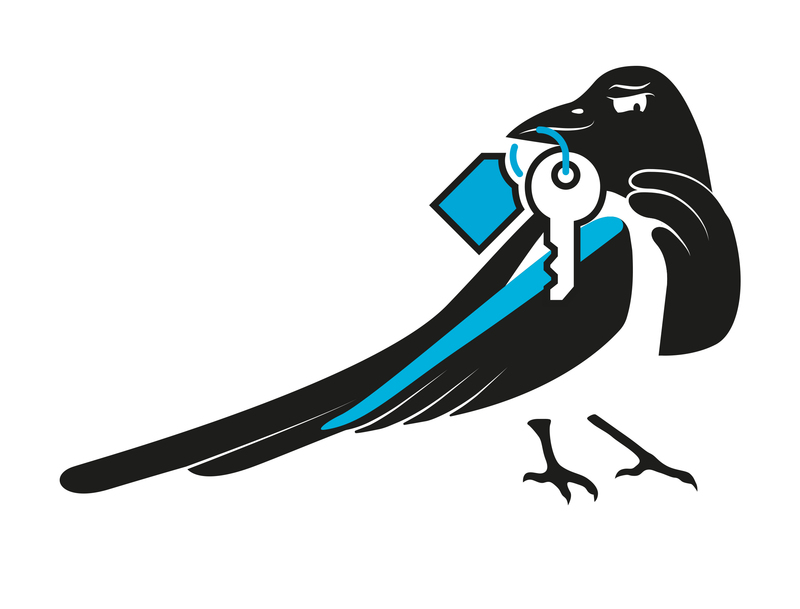 The mascot: We wanted to use a Magpie character to represent thieves given they are renowned for collecting shiny objects or stealing things that don’t belong to them (if you’ve lived in halls and left your windows open, you may have already encountered an opportunist Magpie after easy pickings). ‘Crooks’ the Magpie was created. So far, we believe our efforts are working, but we are still striving to make the Library as safe as it can be for our students. Valuable items such as Beats headphones, Apple Macs, are targeted by criminals. Laptop trackers only work if the laptop is switched on, so cannot always be relied upon as being traceable. The Library can only do so much, it is up to you to ensure your personal items are safe. Apple Mac chargers are classed as low-value items. These tend to get left behind unintentionally and can eventually end up in the lost property bins where identification is pretty much impossible. Popular items like these should be personalised so you have a better chance of reclaiming them. Less than half of the items stolen in the last 2 years were Apple products – it is a misconception that thieves only target Apple items. Visit our web page warwick.ac.uk/library/safe to see more information about the #KeepItSafe campaign. Tweet us at @warwicklibrary, email us at libraryblogs@warwick.ac.uk, or leave a comment below.